It really doesn’t get much easier. Our charcoal starter is made from a large coffee can such as Folgers or Maxwell House. If you know someone who works in a restaurant or cafeteria kitchen, see if they can get you one of the large size cans (#10) from the fruits or vegetables. 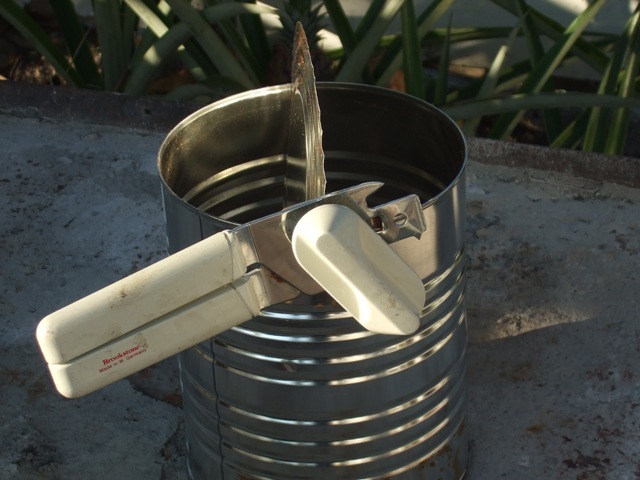 Using a can opener, remove the lid from both the top and the bottom of the can so it is open all the way through, like a metal tube. That is it! You are done. 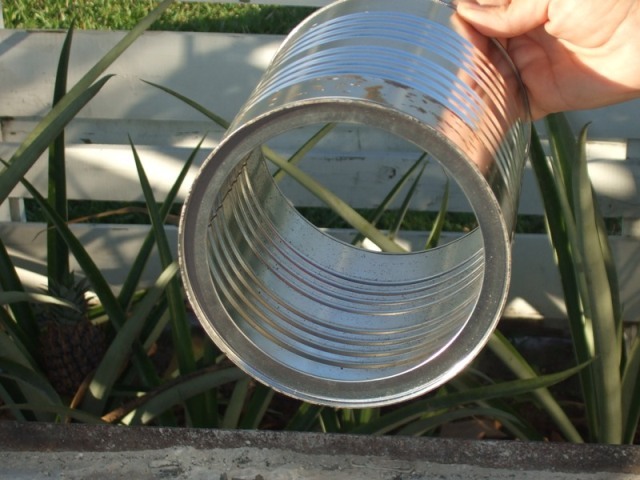 You do not need to punch any holes anywhere in the can, or make a grate, or anything else fancy. This is it. Now all you will need is a grill or charcoal table, and a pair of tongs to handle the chimney and the charcoal when they are hot. The homemade charcoal starter doesn’t have a handle, so instead of picking up the hot chimney to dump it over, we use tongs to pull the chimney straight up and the coals just dump out naturally from the bottom. Then we use the tongs to spread the coals in the grill. You can also use the tongs to pick up the hot coals individually to put on and under the Dutch oven if you will be using the coals for your Dutch Oven. 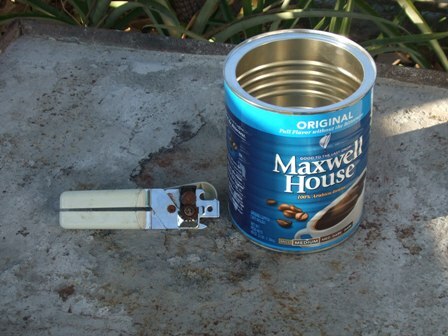 In the past, we used to use a church-key type can opener to put ventilation holes along the bottom of the can, but over the years we have learned to use elevate the can on a few of the charcoal briquettes and this provides plenty of ventilation, making the ventilation holes in the can unnecessary. commercial charcoal starters as well.